picture taken by me. see more here. 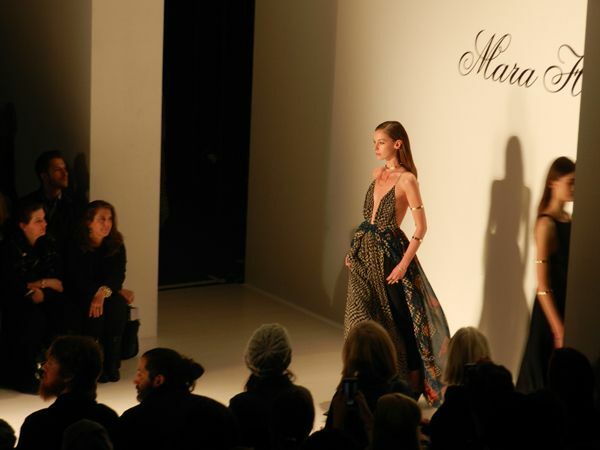 Mara Hoffman is always one of the shows that I look forward to seeing each New York Fashion Week. This season Hoffman did not disappoint. This season Hoffman found inspiration in Northern Africa, specifically in Moroccan Rugs, Egyptian Camels, and Bedouin Jewelry. This inspiration fit perfectly into her aesthetic. 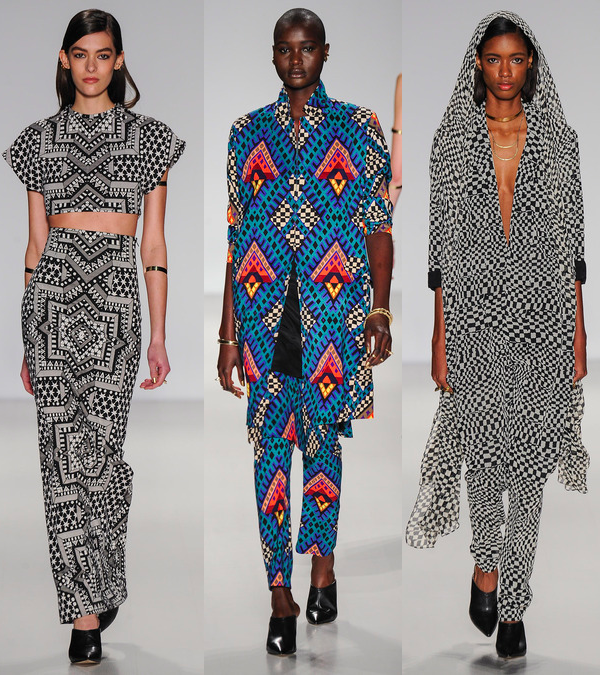 The prints were Hoffman's typical tribal prints with vibrant color and a boho vibe. She add in tailored coats and trousers along with beaded looks into her repertoire. I was lucky enough to meet up with my blogger pal Simone, of Fashion Runs the World to watch Hoffman's Fall 14 show (we met last season on line for the show! )..while we watched the models flow down the runway we both instantly noticed the African inspiration without even fully knowing the inspiration behind the collection. 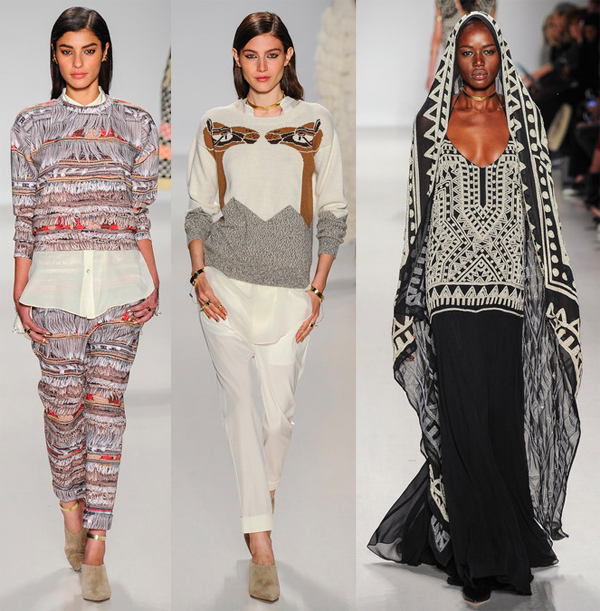 It was clear to see pieces that were inspired by Norther Africa like the hooded looks and the maxi dresses paired with paired with pants. I love that Hoffman is able to bring a little bit of life into the fall. I'm also happy to see that she mixed in more practical pieces for the fall like coats, sweaters, trousers, and more long sleeve pieces. One of my favorite pieces is that camel sweater. I'm such a sucker for a good graphic sweater! But I was absolutely taken by the finale piece (right bottom row). The print, the inspiration, the flow of the dress...all of it was just so on point. Also I totally digged the arm bands! 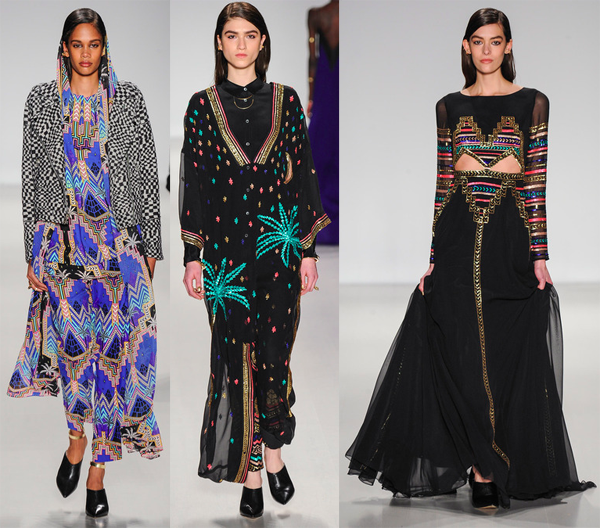 What do you think of Mara Hoffman's Fall 2014 collection?